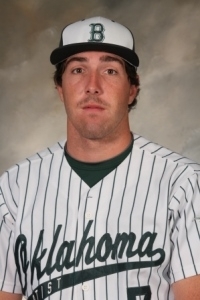 Oklahoma Baptist, Georgia Gwinnett, and San Diego Christian each had three players drafted. The Cumberland Bulldogs won their third national championship by defeating Lewis-Clark State 3-0. 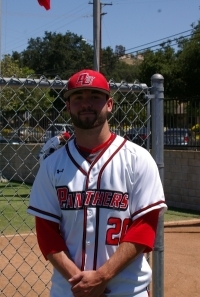 Anthony Gomez pitched his second complete game of the tournament, allowed six hits, threw 138 pitches. It was his second win of the tournament over the Warriors. The only run he allowed in the previous game was unearned. 2B Sam Lind was the tournament MVP. Jeff Butler of Oklahoma Wesleyan won the Charles Berry Hustle Award. Of the eight games played so far, four of them were decided by one run. Cumberland got two big wins. The fans saw excellent pitching performances by Julian Merryweather of Oklahoma Baptist and Anthony Gomez of Cumberland. Saturday night's game drew 4,175. Unless you're a fan of San Diego Christian or Georgetown College, this tournament is going well. The Thunderbirds trailed 3-2 going into the bottom of the ninth. SS Tyson Popoff led off with a single. CF Bryan followed with a double. The Panthers brought in Ryan Butzer to replace reliever Jonanthan Cheshire, and RF Jerod Bartnik was intentionally walked. With the tying run on third and nobody out, the Panthers had the infield at double-play depth. LF Tyler Enns hit a single to score Popoff and tie the game. With the bases still loaded, 3B Kevin Biro was hit by a pitch, scoring Arthur to end the game. The Panthers led the game most of the way. They got on the board first when DH E.J. Grochowalski came home on a double play in the fourth inning. They took a 3-0 lead in the fifth inning on an RBI double by SS Derek Dennis and a sacrifice fly by Grochowalski. 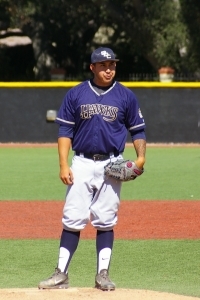 RHP Eddie Rivera pitched the third shutout of the tournament in four games, and the host team went two-and-out without scoring a run. Rivera held the Mustangs to one hit, struck out three, walked two, threw 106 pitches. The winning run came in the second inning, on a classic example of small ball. CF Thomas Mobley led off with a double, was bunted to third base by RF John Schwer, then scored on a sacrifice fly by 2B Taylor McKnight. The insurance run came in the eighth inning, when SS Nick Rodda scored on a single by LF Brandon Sandoval. Rodda reached on a fielder's choice, then went to third on a bad pickoff attempt. The NAIA Coaches' Poll for April 29, 2014, with Boyd Nation's ISR ranking. #1 Oklahoma Baptist swept Saint Gregory's, 18-11, 12-4, and 16-5. The first game was closer than the score indicates; both teams had twelve hits, and the Bison didn't put it away until they scored five runs in the top of the ninth inning. CF Joey Szczepanski went 4-for-6 with a three-run home run, five RBI, and four runs scored. 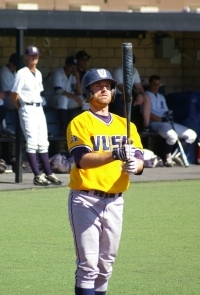 1B Steven Knudson hit two home runs in the second game, batted in three runs. Julian Merryweather got the win, went eight innings, allowed four runs on ten hits. Knudson got another home run in the third game, went 3-for-4 with three RBI and three runs scored. Jinny Parra got the win, allowed four runs on six hits, struck out seven. Parra's record is 6-1, 1.99 ERA. The Bison then defeated now-Division II Rogers State 3-2 in twelve innings. Szczepanski hit an RBI double for the winning run in the 12th. Frankie Wright, who allowed one hit over the last two innings, got the win. Szczepanski had another double, was 3-for-6 for the game. 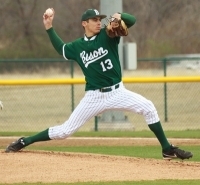 Merryweather is 9-2, 1.39 ERA, 91 K. The Bison have won 15 straight, and they won the Sooner Athletic Conference pennant. They are co-hosting the SAC tournament May 2-5. Live video The Bison play Mid-America Christian in the first round. #16 Oklahoma City plays Southwestern Assemblies of God. #2 Lewis-Clark State dropped their first game against Division II Northwest Nazarene 11-10, then won the remaining three games 12-5, 9-0, and 1-0. The Warriors were charged with four errors in the first game. The Crusaders got the winning run on a sacrifice fly by CF Josh Hatfield in the eighth inning; Hatfield had three RBI's for the game. Aaron Vaughn got the win for the Crusaders, despite giving up eight earned runs on 14 hits over eight innings. The Warriors didn't over the second game until the seventh inning, when they scored four runs, two of them on a single by RF Cody Lavalli. CF Ryan Sells went 2-for-4 with a home run and four RBI. Ty Jackson and Nick Lemoncelli combined for the shutout in the third game. They allowed two hits apiece, and Lemoncelli struck out five in three innings of work. Lavalli, 1B Jacob Cano, and LF Zach Holley hit home runs. The only run of the fourth game came from an RBI double by DH Jake Shirley in the top of the ninth. The Crusaders loaded the bases in the bottom of the ninth, but David Murillo got a strikeout to end the game. Shirley was 4-for-5 for the game. J.T. Kaul, Beau Kerns, Joe Mello, and Murillo combined for the shutout; Mello got the win. The Warriors finished the weekend with a 2-1 win in a non-conference game at nearby C. of Idaho. The Warriors' only runs came from a two-run home run by Jackson, playing first base in this one. Cody Chartrand got the win, went five innings, allowed a run on five hits. Gunnar Swanson and Michael Noteware held the Coyotes hitless the rest of the way. Lavalli has 13 home runs, which ties him with seven other players, including Knudson of Oklahoma Baptist and Ruiz of Oklahoma Wesleyan, for second-best in the NAIA. (Forrest Smith of Oklahoma City leads the NAIA with 16.) The Warriors visit Division II Western Oregon May 2 and 4, and visit Linfield, ranked #1 in Division III, May 3.